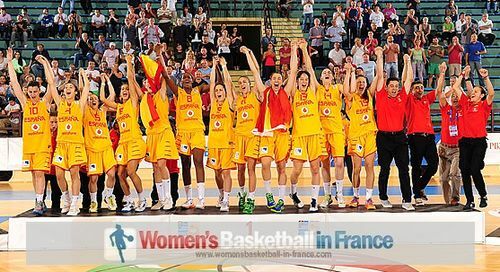 Spain picked up their fourth European Championship title with a victory against France (60-46). This has been a wonderful summer of Spanish basketball at all levels with the complete set of titles (Grand Slam): EuroBasket Women 2013, U20 Champions, U18 Champions and U16 Champions. No other nations has done this before. Spain's dominance in European youth basketball is not restricted to just women. The U16 men also won their European Championship this summer. Leticia Romero from Spain won the MVP award after leading the tournament in steals with 2.7 per game. She also averaged 13.1 points, 3.6 assists and 5.1 rebounds. She was joined in the all tournament team by Laura Cornelius (Netherlands), Marine Johannes (France), and the Serbian duo of Aleksandra Crvendakic and Dragana Stankovic. 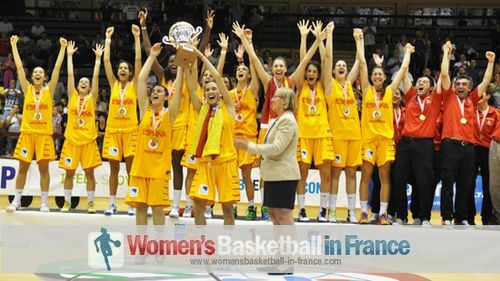 Spain completed a memorial as well as a historical basketball golden summer as they stepped on the top of the podium at the U18 European Championship Women. 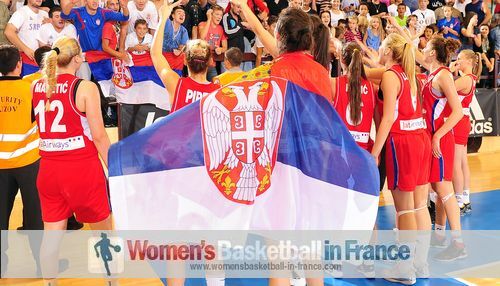 They beat France (60-46) in the last match of the tournament in Vukovar to complete the clean sweep of the European Championship titles and deny France in becoming the first nation to defend the U18 Division A title. During the first 30 minutes both teams had their moments. The game was nicely balanced going into the fourth quarter with Spain leading (43-41). A Spanish 9-0 run in the last quarter was all that was needed for Spain to finally break the ice and put France away. Leticia Romero who is off to the NCAA fired in 22 points and picked up 12 rebounds and had 3 assists in the victory for her side. Maria Arrojo (13 rebounds) and Ariadna Pujol scored 12 and 11 points each. For France Clementine Morateur was the only payer in double digits with 17 points. Lysa Millavet had 9 points and 11 rebounds. You may watch the European Championship video highlights of the gold medal game as well as the bronze games in the right menu. Sometimes it is hard to describe the last actions of a basketball game, especially when it is won on the buzzer. Serbia trailed against the Netherlands for most of the game. Yet with a turnaround jump shop from Dragana Stankovi, Serbia beat the Netherlands (57-56). So just like in 2012 the Netherlands missed out on a medal on the final day. Stankovic finished with 23 points and 13 rebounds. All-tournament team member Aleksandra Crvendakic had 15 points and 8 rebounds for Serbia while Laura Cornelius led Netherlands with 19 points. Russia finished fifth after putting together a 15-2 run during the second half of the game against Italy to win (65-56). Sweden again scored less than 50 points and ended up losing the 7th place to Turkey (48-69). Portugal won their last six games to claim 9th place. They beat Greece (69-56). The Czech Republic ended their tournament with a victory (74-52) to claim 11th place against Slovenia. In the only game that mattered in the lower classification round, host nation Croatia signed off the U18 Championship with a smile after they avoided relegation by sending the Slovak Republic to Division B with a (52-47) win in Vinkovci. As so often Inja Butina was the driving force for Croatia, leading the home team with 16 points. In the match between the two teams already relegated Belarus won their first game of the tournament to claim 15th place against England (73-69).